BRUSSELS, Belgium, January 28, 2013 (ENS) – The “Type 2” plug developed by the German company Mennekes will be the common standard for charging electrified vehicles across the European Union, the European Commission has announced. Long sought by EU automakers, the common standard was announced Thursday as part of a set measures to build alternative fuel stations across Europe with common standards for their design and use. Clean fuel that helps reduce greenhouse gas emissions is being held back by three main barriers, the Commission said – the high cost of vehicles, a low level of consumer acceptance, and the lack of recharging and refueling stations. In this small circle, refueling stations are not being built because there are not enough vehicles. Vehicles are not sold at competitive prices because there is not enough demand. Consumers don’t buy the vehicles because they are expensive and the refueling stations are not there. To break the circle, the Commission is proposing the Clean Power for Transport Package, with the common EU wide standard for plug-in charging equipment as well as binding targets on Member States for a minimum level of infrastructure for clean fuels such as electricity, hydrogen and natural gas. “E-mobility can be part of a long-term solution to our mobility challenges. However, we need to have the right framework conditions if it is to really take off,” Ivan Hodac, Secretary General of the European Automobile Manufacturers’ Association said. “We want to avoid a situation where customers have to carry a multitude of charging cables to use their vehicles in different cities, regions and countries, just as we see today with items like mobile phones,” he said. As of November 2012, about 15,000 electric vehicle charging stations had been installed in Europe. But EV charging has become complicated with different standards in use in various countries. Only France has a Type-3 charger format, compatible with all national European codes for use in buildings and connection to the electric grid. Germany uses the Mennekes Type-2 charging plug. It is this plug that has now been proposed as the common standard for the whole of Europe. The charging coupler is suited for both AC and DC charging. The German connector has no shutter, a cover to prevent electrocution when the plug is not in use. Currently, this makes it impossible to use in England, Spain, Italy, Sweden and Finland, where a shutter cover is required. In the United States, the Society of Automotive Engineers has selected the J1772 combo plug as the standard, which also allows for both AC and DC charging using the same plug. 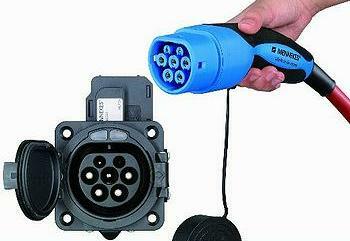 The rival CHAdeMO standard is supported by Japanese automakers such as Nissan and Mitsubishi. The physical connectors are different shapes, and the protocols that control the chargers are different too, so a drivers cannot use a single plug adapter for all systems. CHAdeMo is already installed on Japanese cars like the Mitsubishi i-MiEV and the Nissan Leaf. 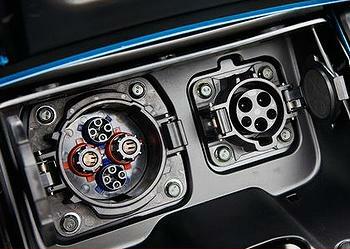 CHAdeMO is a form of DC Fast Charge, for high-voltage, high-current automotive fast charging. It’s complicated. For more complete information on electric vehicle charging standards, click here. Under the Clean Power for Transport Package a minimum number of recharging points, using a common plug, will be required for each of the 27 EU Member States. The aim is to put in place a critical mass of charging points so that companies will mass produce the cars at reasonable prices. The entire package includes a Communication on a European alternative fuels strategy, a Directive focusing on infrastructure and standards and a document describing a plan for the development of liquefied natural gas (LNG) in shipping. Hydrogen: Germany, Italy and Denmark already have some hydrogen refuelling stations although some of them are not publically accessible. Common standards are still needed for certain components such as fuel hoses. Under this proposal, existing filling stations will be linked up to form a network with common standards ensuring the mobility of hydrogen vehicles. This applies to the 14 Member States which currently have a Hydrogen network. Biofuels: already have nearly five percent of the market. They work as blended fuels and do not require any specific infrastructure. A key challenge will be to ensure their sustainability. LNG: Liquefied natural gas is used to fuel trucks, but there are only 38 filling stations in the entire European Union. The Commission is proposing that by 2020, refuelling stations are installed every 400 kilometers (250 miles) along the roads of the Trans European Core Network. CNG: Compressed natural gas is mainly used for cars. One million vehicles currently use this fuel representing 0.5 percent of the EU fleet – the industry aims to increase this figure 10-fold by 2020. The Commission’s proposal will ensure that publicly accessible CNG refueling points, with common standards, are available Europe-wide with maximum distances of 150 Km by 2020. No action is foreseen for liquefied petroleum gas, LPG, because the core infrastructure is already established. Member States will be able to implement these changes without public spending by changing local regulations to encourage private sector investment and behavior, Commissioner Kallas said. EU financial support is already available from TEN-T funds, cohesion and structural funds. “It will only be possible to book real progress if there is full cooperation between utility providers, infrastructure companies, the energy sector, standardization bodies and the automotive industry,” said Hodac. “The full support of national governments and the European institutions” is critical to this effort.